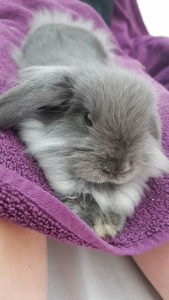 Home » Daily Bunny » Meet Luna! Meet Luna! I am new to having house rabbits but I am learning everything I can. She is doing great and is slowly getting litter trained she’s beautiful and a lovely new member to the family. On the photo below she is getting a pedicure #rabbittherapy.